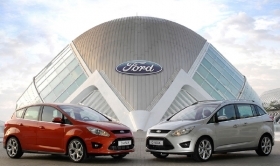 The new Ford C-Max (left) and Grand C-Max go on sale in Europe starting in August. VALENCIA, Spain – Ford Motor Co. is counting on a strengthened C-Max model line to put pressure on European medium minivan segment leaders Renault and Citroen. Ford is getting its factory here ready to make two variants of its second-generation C-Max. It will start producing the five-seat C-Max in late August followed by the long-wheelbase seven-seat Grand C-Max in late September or early October. The first-generation C-Max, which debuted in 2003, has been sold only as a five-seat model. Since 2004, Renault has offered the five-seat Scenic and seven-seat Grand Scenic. Citroen has sold the five-seat C4 Picasso and seven-seat Grand Picasso since 2007. Ford already has benefited from adding variants in the large minivan segment. Ford has dominated that segment since adding the five-seat S-Max in March 2006 to complement the seven-seat Galaxy, which debuted in September 2005. The C-Max and Grand C-Max are the first of at least 10 new models or derivatives that Ford will launch around the world based on its new global C-platform. “We are excited to be producing the first vehicle based on Ford's new global C-car platform,” said Tony Ades, operations manager of the Valencia plan. The C-platform will account for more than 2 million Fords sold globally by 2013. Ford says the Valencia factory can produce 740 units of the C-Max line a day on two shifts or 1,025 a day using three shifts. That translates into about 175,000 to 240,000 units a year. Valencia will produce gasoline and diesel versions of the C-Max model line. Starting in late 2011 the Grand C-Max will be exported to North America, where it will be sold as the C-Max. The United States will not get the five-seat version of the minivan. The C-Max will be built on the same assembly line as the five-door hatchback and four-door sedan variants of Focus compact. The Grand C-Max shares its line with the five-door Fiesta subcompact. Ford also will build full hybrid and plug-in hybrid versions of the C-Max in Valencia starting in 2013. The C-Max hybrids are part of Ford's plan to introduce five battery electric vehicle and hybrid models in Europe by 2013. The lineup also includes the full electric Ford Transit Connect, due in 2011, and a full-electric derivative of the next-generation Ford Focus that arrives in 2012. The fifth vehicle will be announced later, Ford said. Ford will invest almost $410 million in Valencia for the new C-Max model program. That includes up to $36 million for the hybrid and plug-in hybrid variants.